Watch the interview with the PAW Founder, Eric Siegel. In the opening keynote session at the 2013 Predictive Analytics World conference in Boston, only two attendees raised their hands when speaker Eric Siegel asked how many people were actively involved in uplift modeling programs. But about half of the attendees indicated the uplift approach, also known as net lift modeling or persuasion modeling, was on their predictive analytics radar screens. 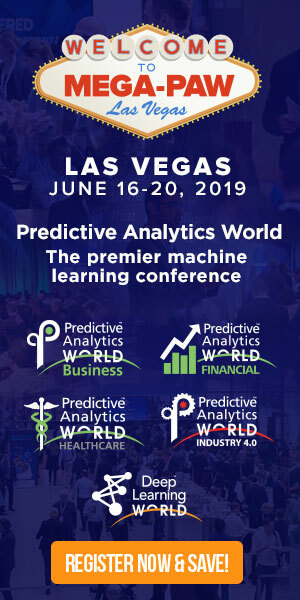 Siegel, the founder and conference chair of Predictive Analytics World, discussed the differences between conventional predictive analytics initiatives and uplift modeling applications in a video interview recorded at the conference. Siegel, who is also the author of Predictive Analytics: The Power to Predict Who Will Click, Buy, Lie, or Die, said predictive analytics as practiced by most companies focuses on detecting likely actions or behaviors before they occur — for example, customers defecting to another supplier or medical patients exhibiting certain symptoms. Uplift modeling, he said, is an advanced form of predictive analytics that seeks to identify people who could be convinced to buy a particular product. As Siegel explained in his keynote speech, customer analytics projects based on uplift modeling techniques place people in one of four categories: “sure things,” “persuadables,” “lost causes” and “do not disturbs.” He said the goal is to improve the effectiveness of marketing campaigns by focusing outreach efforts on the persuadables — those who potentially will decide to buy a product, vote for a candidate, or take another action after seeing ads, reading social media posts, or being exposed to other marketing efforts. Focusing solely on persuadables allows organizations to shift campaigns and marketing budgets away from the other groups — people who either will or won’t buy a product regardless of whether they’re targeted for marketing, and those who are more likely to decide not to buy if they’re approached. Get an overview of predictive analytics and uplift modeling. Learn how uplift modeling can increase the effectiveness and efficiency of marketing campaigns. Hear about some of the potential applications for uplift modeling. Get Siegel’s thoughts on the issues analytics teams can face when dealing with predictive analytics and uplift modeling initiatives.